for a function of and a function of . What will usually happen is that this introduces a natural log in terms of . Exponentiating and solving for then provides a solution in terms of . Solution: It's nearly impossible to ask for even a single solution to this differential equation without knowing more about it. You can graph out the slope field yourself (perhaps not quite as neatly as a computer or calculator, but you can do it). You get a slope field like this. Now it appears a bit more obvious that we're dealing with circles centered at the origin. Let's see if that is actually correct by taking a generic circle, centered at the origin, and determining if it satisfies the differential equation. In what follows, we use implicit differentiation to view as a function of . So, each circle centered at the origin satisfies the given differential equation. We'll start by discussing the formal error bound for Taylor polynomials. (I.e., how badly does a Taylor polynomial approximate a function?) Then, we'll see some standard examples. Finally, we'll see a powerful application of the error bound formula. That is, error is the actual value minus the Taylor polynomial's value. Of course, this could be positive or negative. So, we force it to be positive by taking an absolute value. The following theorem tells us how to bound this error. 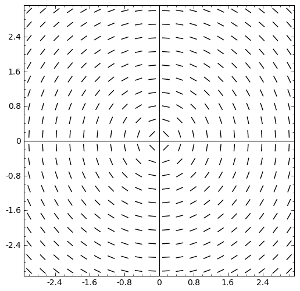 That is, it tells us how closely the Taylor polynomial approximates the function. Essentially, the difference between the Taylor polynomial and the original function is at most . At first, this formula may seem confusing. I'll give the formula, then explain it formally, then do some examples. You may want to simply skip to the examples. where is some value satisfying on the interval between and . There are several ways we could go about obtaining new series from these ones. First, we can substitute inside an existing series. Then, we could differentiate or integrate existing series. We'll consider these with some examples. Since a Taylor series is the same as a Taylor polynomial, but is taken to infinite degree, we already know many Taylor series. From the last section, we know the following. There is a bit of a technicality here. In section 10.1, we wrote between the functions and their Taylor polynomials. Now, we're writing instead. ( means “approximately equal to,” while means “equal to.”) The main point to understand here is detailed in the next portion of these notes. represents the coefficient of the th term. is some (fixed) real number. varies around , and so we sometimes say that the power series is “centered” at .